For more than twenty years, the nuclear power industry has had a singular goal for high-level radioactive waste: get it off their property and ship it to someone else’s. Why? Because as long as this waste–the same toxic stew of irradiated nuclear fuel that spread across the globe from Fukushima and Chernobyl–remains at their reactor sites, the nuclear utilities are liable for any damages. Once the waste is moved from their property lines, we, the taxpayers, become liable for the devastation a nuclear waste accident could cause. The nuclear industry’s primary aim has not been establishment of a scientifically-sound, publicly-defensible permanent solution for radioactive waste, but rather institution of a “centralized interim storage” site. In other words, one or more “temporary” places to stash thousands of casks of lethal high-level waste, regardless of whether the site is suitable for long-term storage. And, for more than twenty years, a loud voice of public opposition has stopped the industry in its tracks. In the 1990s, Congress approved a bill to establish such an “interim” site, but President Clinton listened to the public and vetoed the measure, a veto that was upheld by the Senate. In the 2000s, the industry tried to set up a “private” interim dump on Skull Valley Goshute land in Utah, but that deal fell apart. 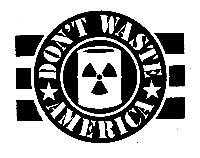 Yucca Mountain, Nevada dumpsite off the table, four members of the Senate Energy Committee introduced legislation (S. 1240) that would have been the first major overhaul of U.S. radioactive waste policy in a generation. And the nuclear industry’s top priority for this overhaul? Centralized interim storage (Nuclear Energy Institute policy brief). But the bill never made it out of committee. In 2015, with a new Republican majority in the Senate, the nuclear industry and its backers are trying again, with a virtually identical bill. This year, the bill number is S. 854. An “interim” storage site would begin the transport of tens of thousands of casks of lethal high-level nuclear waste across the entire United States, potentially affecting 100 million Americans who live within a mile or two of likely transport routes–our nation’s roads and railways. NIRS and its grassroots allies across the country have won tremendous victories in keeping these unprecedented numbers of high-level radioactive waste shipments off the roads, rails, and waterways thus far. But the nuclear establishment is pushing harder than ever to launch these “Mobile Chernobyls” through our communities, and we need YOUR help in stopping them dead in their tracks. 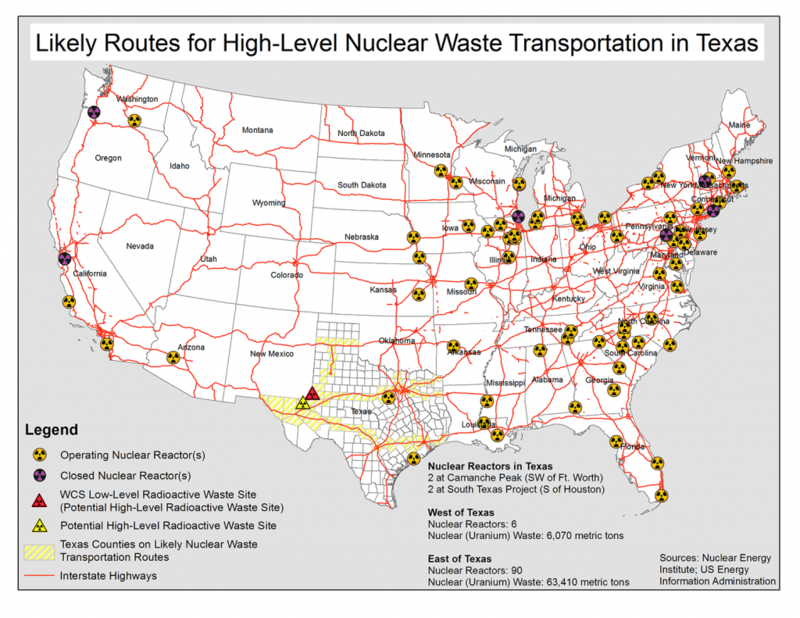 Above is a 2015 map showing likely radwaste transport maps if an “interim” high-level radioactive waste storage facility were built in Texas, as proposed by Waste Control Specialist in that state. The routes would differ somewhat if the site were Yucca Mountain, Nevada. NIRS delivers signatures of 42,000+ people urging stop to Mobile Chernobyl bill (S. 1240) to Senate Energy Committee. Press release. Senate Gang of 4 releases waste bill encouraging "interim" storage. Bill text and other documents. The Senate Energy Committee has posted all of the comments (more than 3,000) it received on its draft radwaste bill. Four Senators (Senate Energy Committee Chair Wyden, Feinstein, Alexander and Murkowski) introduce "discussion draft" of major high-level radioactive waste bill. Includes "interim" storage which would unleash massive transport of radwaste across the country. The Senators also ask several questions for further discussion, and two (Alexander & Feinstein) propose accelerated "interim" storage. Link is to Senate Energy Committee site with draft and several related documents. In one day, 80+ organizations signed this letter to Senate Appropriations Committee opposing centralized “interim” surface storage of high-level radioactive waste. New report from Common Sense at the Nuclear Crossroads Campaign: Is a Mobile Chernobyl converging on the Southeast? The Bush administration’s GNEP project could bring high-level waste–from all across the world–to the South, with the Asheville, North Carolina area in the center of the crosshairs. Safety and Security Concerns about Derailment in Clare County, Michigan of Train Hauling Atomic Waste from Consumers Energy: Inconsistencies Raise Questions about Emergency Preparedness. NIRS press release. Whistling In The (Radioactive) Dark? a second article by Mike Hopping on nuclear transports in Western North Carolina. 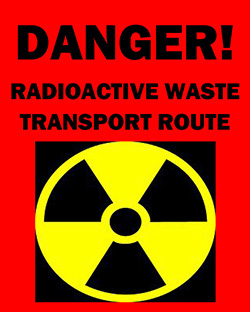 Information on the shipment of high-level radioactive waste through Takoma Park, Maryland, The U.S. Department of Energy has targeted Takoma Park as a transportation route for high-level radioactive waste (HLRW) bound for its proposed national dump-site at Yucca Mountain, Nevada. The CSX railway, immediately next to the Takoma Metro Station, would carry up to nearly 2,000 “truck” containers (truck-sized containers loaded “piggy-back” upon train cars) and/or over 300 much larger “train” containers, of HLRW through town. A single accident or terrorist attack could release catastrophic amounts of radioactivity. Because the waste is so radioactive, emanating gamma radiation like a mobile x-ray machine that cannot be turned off, even “routine,” accident-free shipments would still deliver a potentially harmful radiation dose to innocent bystanders. What if today’s train derailment in Detroit had involved high-level radioactive waste? NIRS press release. Transcript of Southern Conversation (on WNCW–Western North Carolina NPR affiliate) discussion of nuclear shipments through Western North Carolina, Mary Olson & Dr. Lew Patrie. NIRS comments on the U.S. Department of Energy’s “Notice of Intent to Prepare an Environmental Impact Statement (EIS) for the Alignment, Construction, and Operation of a Rail Line to a Geologic Repository at Yucca Mountain, Nye County, Nevada” [Federal Register,Vol. 69, No. 68, Thursday, , pages 18565 to 18569], submitted June 1, 2004. “Spotlight Shined on Secretive Radioactive Reactor Shipment.” NIRS article written , published in the Nukewatch “Pathfinder” newsletter of December, 2003. 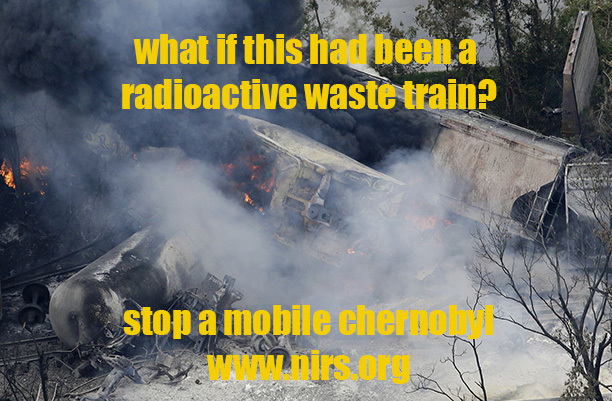 NIRS action alert in opposition to Mobile Chernobyl shipments through Michigan. Bush Administration Stops One Dirty Bomber, But Targets U.S. Cities With Largest Dirty Bomb Program In History. NIRS Press Release. The 2002 Radioactive Roads & Rails Wagon Train Tour is Underway! NIRS has a wagon train of mock nuclear waste casks touring proposed U. S. Dept. of Energy high level atomic waste tranportation routes across America targeted for sending shipments to the Yucca Mountain dump in Nevada- Press Release. What if the Potterville, Michigan Train Derailment Had Involved High-Level Nuclear Waste? : Detroit Edison’s Highly Radioactive Fermi Nuclear Plant Waste Could Travel Grand Trunk Western Railway. NIRS Press Release. Barge rams bridge in deadly Oklahoma interstate highway disaster. But what if high-level radioactive waste had been involved? NIRS letter to the U.S. House of Representatives urging that Nevada’s veto against the Yucca dump be sustained. Security Breach on Nuclear Waste Train. NC WARN Press Release. When It Comes To Atomic Waste Transportation, We All Live In Nevada. Gorleben International Peace Team (GIPT) press release, “The Peaceful Atom? International Team Observes Human Rights Violations during Radioactive Waste Shipment to Gorleben,” NIRS’ Kevin Kamps served as a GIPT human rights monitor during the police crackdown on resistance against the shipment of high-level radioactive waste to Gorleben, Germany. Kevin Kamps is quoted in the Issue of Newsweek. What If Baltimore Train Tunnel Fire Had Involved High-Level Nuclear Waste? Press Release. Radioactive Roads and Rails, Part II will take place during 2001. Current plans are to visit 10 states. Nuclear Waste Cask Tour!You can get involved in the tour! Download and sign (and get your friends to sign) this petition opposing use of Native American lands in Utah for high-level atomic waste storage! Why We Call It “Mobile Chernobyl”. NIRS press release: Citizens Rally to Protect the Great Lakes-Urge Michigan’s Attorney General to Stop Plutonium Shipments, NIRS press release. DOE’s “Parallex” shipment of weapons-usable plutonium MOX nuclear fuel from Los Alamos, New Mexico to Chalk River, Ontario, Canada. NIRS Alert.